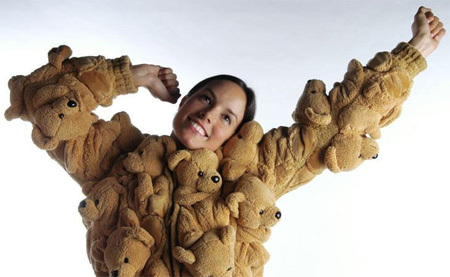 Designed by Sebastian Errazuriz, this extremely creative Teddy Bear jacket will keep you warm and get you noticed. Ugly… and a little disturbing. Totally awesome, now Teddy bears can travel with you everywhere you go! If Cruella DeVille had seen bear cubs instead of Dalmation puppies . . .
just a good idea for halloween costumes. actually not cool! my heart actually skipped in fear when the page loaded. ugh..
I`d cuddle with her for SURE!!! She`d have to take the jacket off first though. I`m not ready for a real-life teddy bear montage that gets worn. Well, now I know what might have become of all of H.R. Giger’s teddy bears. I don’t understand the “creepy” comments. Perhaps I’m too much of a designer. It’s FUN PEOPLE! Looking especially good on someone slim! I love it! Will take it! Creepy, honestly. I don’t know how else to see it. 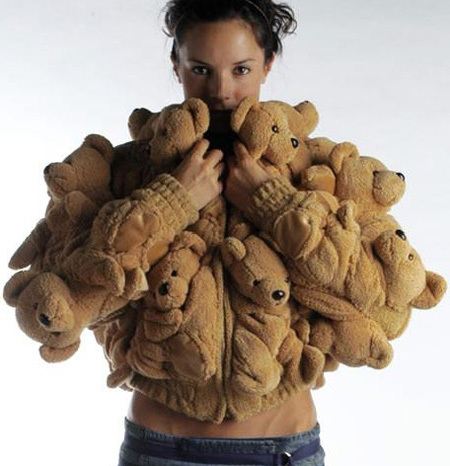 It looks like you took a bunch of teddy bears, melted them down partially, and then fused them together. this is creepy, and looks like that stuff you see in acharity shop, the stuff that some wierd lonely old lady has made to talk to. hideous, fugly, whatever. I DO NOT WANT!!! Excuse Mr/s designer, but designer clothes is for certainly some ppl, not for everyone OR anyone, and i don’t think is creepe or cute, i simply say, it’s stupid. And WTF with the model anyway? Well I know a few people who still love stuffed toys even though they’re already very respectable, full-fledged adults, so I’ll let them know about this, they might like it and help me look at it from their perspective. I guess it’s just the model threatening to bare nothing underneath that bear jacket that disturbed me. Looks like something Lady Gaga would wear, thought it is cuter and less freaky than her frog number. The Prevention of Cruelty to Teddy Bear people are gonna be after her. This might work on a 3 year old…with smaller bears. My daughter would love this! Very cool! What wrong with you people–where is your sense of humor and fun? !